Dissolve yeast & sugar in warm water,mix & leave it to froth. In a large bowl mix pancake flour,parsley & half of the butter. Now pour the yeast mixture & knead it to a soft dough. Your dough will be slightly sticky,sprinkle very little flour & knead it to a soft dough. Make small balls & arrange them in a baking pan. Cover it with a wet towel & rest for an hour for the rolls to rise. Pre.heat oven to 375 deg F,brush the remaining melted butter on top & bake it for 10 to 15 minutes or till done. Preheat oven to 350°F. deg. Grease bottom and sides of a 13×9-inch pan with cooking spray or butter, lightly dusted with flour. Beat egg,oil & sugar with an electric beater on low speed for about 30 seconds or until blended. Stir in vanilla essence & keep it aside. In a separate bowl, mix flour, cinnamon, baking soda, and the salt. Add dry ingredients to wet and beat on low speed for 1 minute, until well combined. Stir in carrots, nuts, raisins, pineapple,just until combined. Pour into the greased pan,bake for 30 to 35 minutes or until toothpick inserted in center comes out clean. Pre.heat oven to 350 deg F.
Take a bowl add garlic,chilly flakes,salt,parsley & butter.Mix everything well. Place the bread on a cutting board,use a sharp bread knife to cut the bread. Score the bread loaf crosswise & lengthwise into small squares.Don't cut all the way down. Same way stuff the shredded cheese into the cracks. 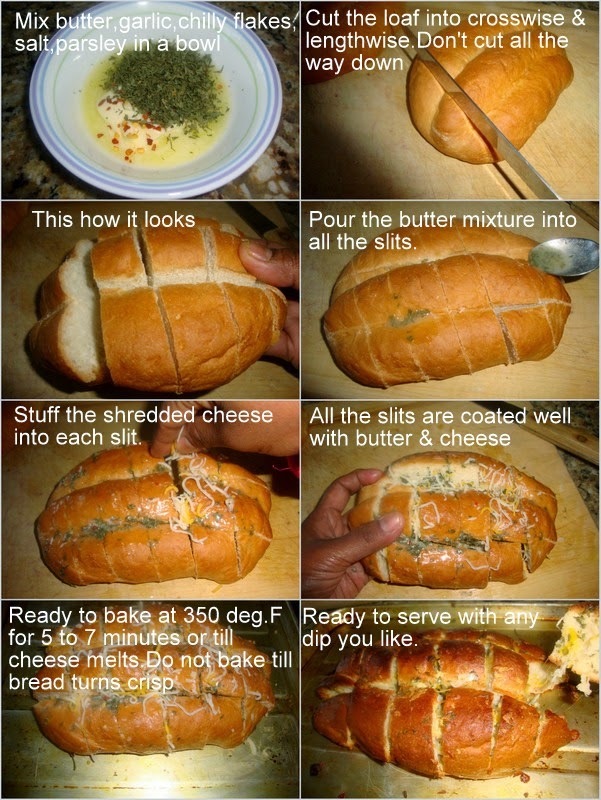 Place this bread on a baking tray & bake for just 5 to 7 minutes or till the cheese has melted. Do not bake till bread turns crisp or brown. Serve immediately with any dip you like. a) You can replace parsley with freshly chopped green onions. b) Instead of shredded cheese you can also place small pieces of any kind of melting cheese slice in the slits you made on bread & then bake. Melt chocolate chips in a double boiler or in microwave. Add the butter mix it till melted, keep it aside. Beat eggs & sugar until fluffy. Add the melted chocolate mixture & the flour into the egg mixture, mix until well incorporated. Grease the ramekins with butter,pour the batter till 3/4th into the ramekins. Bake it at 350 deg F. for just 10 minutes. Once warm loosen the sides & unmold. Dust the work surface with flour,unfold the thawed ready made puff pastry sheet. Evenly spread the melted butter on top of the pastry sheet. Generously sprinkle the sugar on top of the sheet. Chill the pastry for 10 minutes in fridge. Cut the roll into 1/2 inch thick slices,arrange them on a baking tray. Bake it till light brown for 25 minutes or till crisp & light brown at 350 deg F.
Once baked remove the tray from the oven & sprinkle sugar on top while still hot. Cool completely & store them in an air tight container. a) You can use only white sugar in this recipe.Increase the sugar if you want it more sweeter. Sieve flour,salt,baking soda & all spice powders,keep it aside. Beat oil,eggs,sugar,brown sugar & essence together. Dust the soaked nuts with one or 2 tsp of flour,make sure they are evely coated. Add the flour to the beaten liquid ingredients,mix it thoroughly. Fold in the dusted nuts,pour it in a greased pan & bake it for 30 minutes or till done at 350 deg. Cool completely & then cut. Brush the cake with some rum on top,wrap it with a butter paper & cut it next day.It gives a rich taste when eaten the next day. Pour water & knead to a soft dough. Cover the dough with a wet cloth & rest it for 30 minutes or till doubles. Punch it up to remove air bubbles.Roll it out into a big rectangle shape on a greased kitchen counter top or dust it with flour to prevent stickiness. Apply the filling evenly,roll them like a log. Cut into small pieces,& place the cut side up on the greased baking tray. Apply the balance garlic spread on top & sprinkle some sesame seeds on top. Cover & rest for another 20 minutes for the dough to rise. Bake it till light brown for 20 minutes or till done at 350 deg. Brush it with little butter & serve them warm. Pre.heat the oven to 375.deg. Line a long rectangle baking tray with a parchment paper. Sieve maida & baking powder together,keep it aside. Whip the egg whites & salt till it form peaks.Beat the sugar & yolk till its creamy.Add the essence & flour mixture,beat till smooth. Fold in the egg whites into the cake batter.Pour this on the lined tray & bake for 10 minutes till the top is slightly brown (do not bake more than 10 minutes,cake will become crispy & hard). While still warm turn it onto a parchment paper which is sprinkled with caster sugar.peel of the parchment paper & spread the custard evenly on top. Now slowly roll the cake it to a tight log. 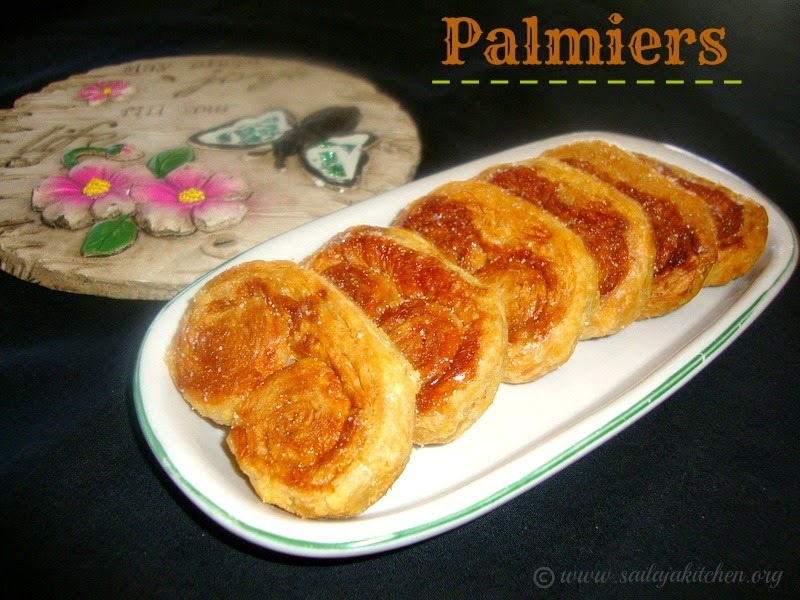 Keep it in fridge for 5 minutes & then cut into circles & serve. Sieve maida ,salt & baking powder,keep it aside. Beat oil,eggs,essence,butter milk & sugar till sugar is dissolved. Slowly mix in the dry ingredients,gently stir until just combined. Divide the batter into 4 equal parts,mix 3 colours separately in the bowl & keep one bowl as plain. Mix the colours well so no streaks of plain batter remain. 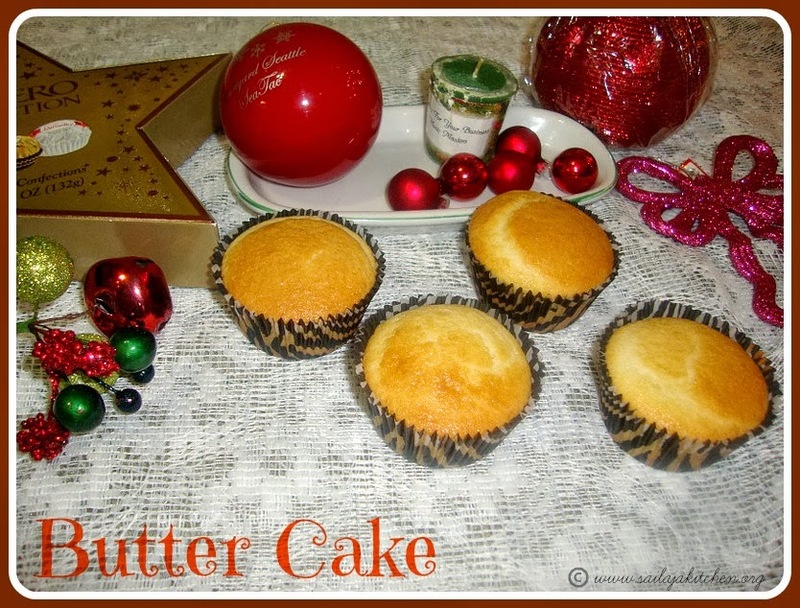 Pour a tablespoon of yellow batter in a non stick muffin pan,on top green batter,next white & end it up with red batter. Preheat the oven at 350 deg & bake for 15 minutes or till done.. In a bowl stir together water,yeast & sugar,rest it for 10 minutes till its foamy.Mix flour,salt & oil in another bowl,slowly pour the yeast mixture & knead it to a smooth dough. Dust a kitchen counter top with little flour & knead the dough for 8 minutes until the dough is elastic. Grease a bowl with little oil & cover the dough with a wet cloth & leave it to ferment for 2 hours,or until dough is doubled in size. In a small bowl, combine melted butter, parsley flakes,chilly flakes, and minced garlic,keep it aside. Punch the dough,tear off small pieces of dough(a size of a small lemon).Coat each ball into the butter mixture.Place each ball at the bottom of a bundt pan.Repeat this process until you have one layer of dough balls. Sprinkle the Parmesan cheese,continue layering the dough balls and cheese until you have 2 layers. Cover the pan with a clean towel and allow to sit until dough has doubled in size around 20-30 minutes. Pre .heat an oven to 350 F deg. bake it for 30 minutes or till slight golden brown on top. Pre.heat your oven to 400 deg.Beat butter & sugar till smooth.Add the essence,egg,egg yolk & beat it for another 2 minutes.Now add the flour & the poolish knead it well.As i don't have a stand mixer i used my kitchen counter top to knead the dough.After kneading well add the soaked fruit mixture,orange & lemon zest. Dust your kitchen counter top ,using your hand knead the dough to make sure the fruits are well incorporated.Cover it & rest it for 2 & 1/2 hours in a warm place until it doubles in size.Take the dough & put it into the prepared pans,press it well & leave it to ferment again for 1 hour. 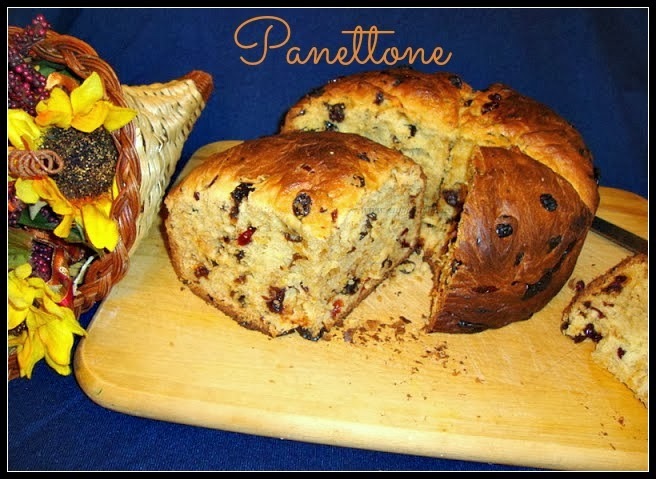 As i don't have a panettone pan,i used my regular round cake pan lined it with a parchment paper both bottom & sides.The parchment paper on the side portion was a bit higher than the Pan's brim because the dough will rise above the pan while fermenting. Make a X mark on top of the bread & place a very small cube of butter at the middle.Now bake the dough at 400 deg. for 20 minutes,then reduce the temperature to 350 deg bake for 10 minutes.Place a foil loosely on top of the bread & bake it for 20 minutes. Each oven temperature varies,make sure you don't burn.Bread is done if your tooth pick inserted in the middle & comes out clean. Remove from oven cool completely & then cut. Sieve maida,salt & baking powder & keep it aside.Cream butter,sugar & essence till fluffy & doubles.Add the eggs one by one & beat it well. Add the sifted dry ingredients to the creamed mixture alternately with the milk.Stir until just blended. Pour batter into a greased pan. Bake it at 350 deg. for 30 minutes or till done.Cool completely before cutting. Make a soft dough with the above ingredients.Cover & keep it in fridge for 1 hour.Dust the kitchen top with flour & roll it out into 1/4'' thickness. Cut into circles (I used a tea cup). 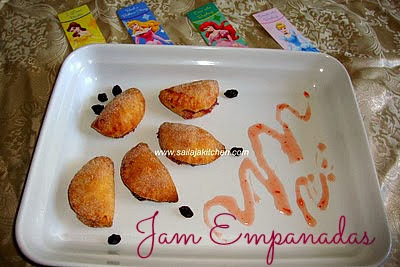 Place circles on a parchment paper lined pan.Place a teaspoon of jam in the center of each circle. Damp the edge of circle with water, fold in half, and press edges together with a fork (make sure they are well sealed up or the jam will come out). Bake at 350 degrees for 25-30 minutes, or until lightly golden brown. When cooked, remove from oven and allow to cool for 5 minutes on a rack.Dust the empanadas in the sugar/cinnamon mixture till coated. Pre.heat oven to 350. deg.Beat butter & sugar till light & fluffy.Add the essence,salt & flour,mix it until its incorporated.Spread this mixture on a square pan which is lined with an aluminium foil on sides & bottom.Bake till 20 minutes or till the short bread is golden brown.Remove from oven & immediately sprinkle the chocolate chips on top,Keep this in the hot oven just the chocolate to melt,remove from oven spread it using a knife on top of the shortbread.Sprinkle the nuts on top,press it a bit.Cool completely & cut into squares. 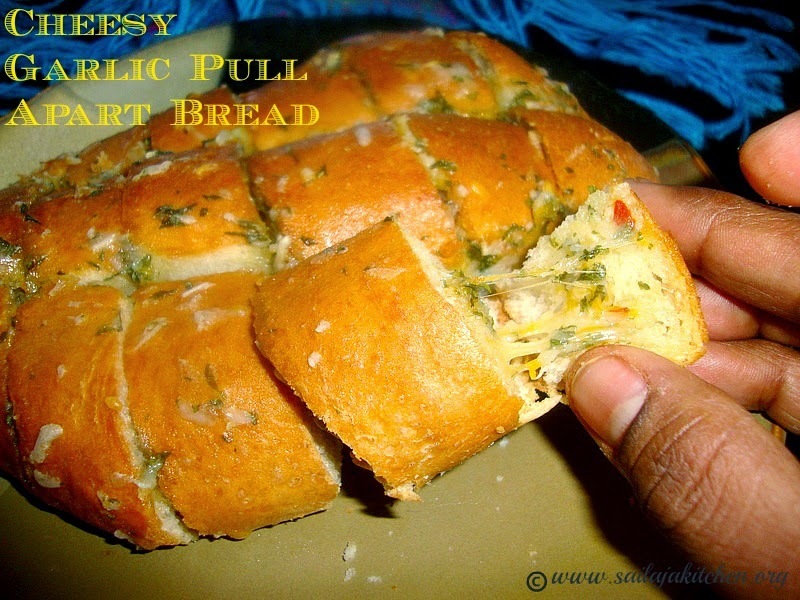 Mix the flours,chilly flakes,salt,garlic & coriander leaves in a wide bowl.Mix the sugar & yeast in warm milk & water,keep it for 5 minutes.Now pour this mixture into the flour,add oil & knead it to a soft dough.apply some oil on top of the dough,cover it with a wet cloth & leave it for 1 hour.Punch the raised dough.Form it into small balls & place it on a greased tray.Brush the top with some milk & sprinkle some sesame seeds(optional).Bake these buns at preheated oven for 12 minutes at 325 deg. or till done.Remove from oven & brush the warm buns with butter & serve. Sieve flour,salt ,baking powder,baking soda.Mix buttermilk,lime juice & essence.Cream together butter & sugar till light & fluffy.Add the eggs & zest of lemon & beat it well.Slowly add the flour & lemon buttermilk mix to the sugar butter mixture alternatively beginning and ending with flour. Add raisins and gently mix.Bake it at 350 deg. 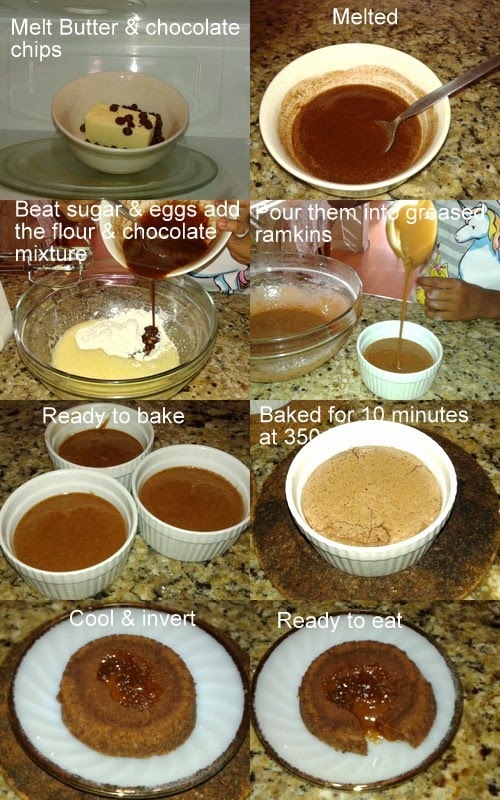 for 40 minutes or till done.cool the cake completely & then pour the glaze over the cake. Courtesy:chitchatcrossroads with a slight change. Heat sugar & coconut in a sauce pan for 2 minutes.Switch of the stove add all the above ingredients.Mix it well & keep it aside.Take 2 puff parathas,roll 1 paratha little bigger than the second one.Place the filling in the center & spread it well.Close it with the second paratha(smaller one) & seal it well.Heat an oven & bake it for 10 minutes or till light brown at 325 deg.Cool & cut & serve. Mix maida,baking powder,salt,keep it aside.In another bowl beat all other ingredients together.Slowly fold in the dry ingredients.Pour it on a greased baking tin.Bake it at 375 deg. for 30 minutes or till done. Cream butter & sugar till light & fluffy,then beat in the eggs.Sift together the flour,baking powder,baking soda& cocoa powder.Beat 1/3 of the flour mixture & 1/2 of the buttermilk into the egg mixture.Repeat,ending with the flour mixture,blend until well incorporated. In a blender combine all ingredients under flan.Blend on high for 30 seconds. Scoop the cake mixture into the prepared bundt pan & spreading evenly.Slowly pour the flan mixture over the cake batter.Cover it with a foil & add about 1 inch of hot water to the roasting pan. Carefully slide the pan into the oven & bake for 1 hour or until the surface of the cake is firm to touch.Cool the cake completely & then invert it.Garnish it with chopped nuts,cajeta & serve. Today I am celebrating my 8ooth post.......Enjoy!!!!!!!!!!! Grease a 9''round cake pan with 2tbsp of butter & sprinkle the brown sugar on top.Arrange the apples on top.Sieve flour, baking powder, salt, and cinnamon keep it aside.Cream butter with sugar until light and fluffy. Add eggs and vanilla essence beat until incorporated. With mixer on low speed, alternately add the flour mixture and the milk,mix till blended.Pour the batter on top of the apples & bake at 350 degree for 45 minutes or till done.Cool completely before cutting.